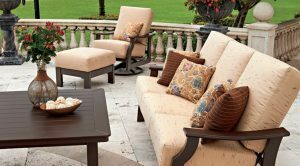 Patio furniture need to be cared for the same way that you do for your indoor furniture. Cleaning and maintaining your outdoor furniture can make your patio shine like it did when you first bought your house! Many homeowners fail to take care of their patio, resulting in an assortment of dead bugs, spider webs, and layers of dirt lying around the entire space. Here are some ways that you can care for your patio. Your couch foam needs to be replaced after an extended period of time. A dirty and flat cushion isn’t appealing to you or your guests. And, if it’s the summer, you could be the host of a birthday party or a family gathering. Outdoor couches should make your patio feel welcoming, not the opposite. Start by storing your seat cushions in a bin to protect it from the rain, heat, and insects. Take it out when you need to use it so it’s not at the mercy of nature 24/7. A tarp or a cover could also be placed on the couch as well. Many retailers sell these for a cheap price! Spruce up your patio floor by sweeping it every so often and even power washing it if you can. This way, all the dirt, grime, and bacteria will be flooded away, leaving you with a brand new floor. If you have wood planks, there are numerous finishes that you can lacquer with to protect it as well as make it shine. Your local hardware store is likely to carry one. Be sure that you purchase the correct one as certain types of wood will respond differently with chemicals. The Foam Factory carries every patio cushion product that you could want or need. For more information, visit the Foam Factory online today.